The kingdom of heaven on earth, idealized by God, was lost through the Fall, and the providence of restoration began. Over the ensuing four thousand years, God prepared the people of Israel and brought Jesus to them. He was unable to form a true family, however, and the people and the nation that should have protected him could not do so. Thus, Jesus had no alternative but to die on the cross. This is God's sad history. Jesus ascended to heaven, promising, "I will come again." 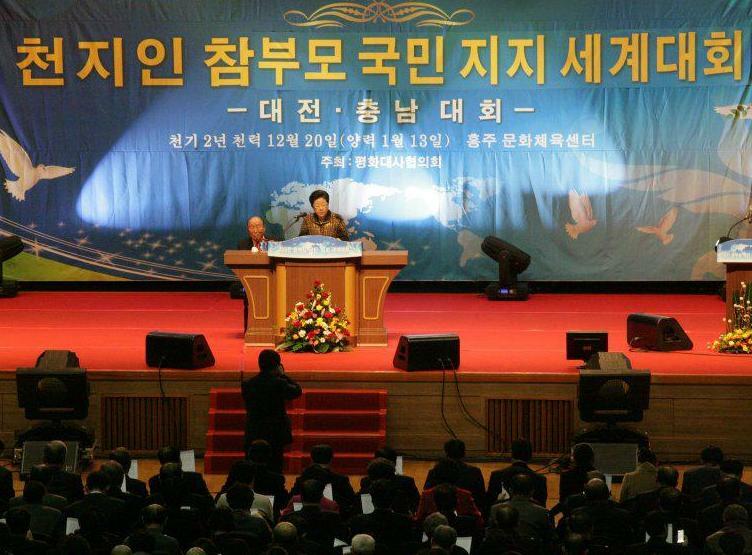 Since then, two thousand years of Christian history came to be centered on Korea through the miracle of the Second Corning, and history, which God had governed since long ago, came to Korea in the form of a new Christian culture, under God's direct dominion, following Korea's liberation.' This culture blossomed in all its splendor, especially in North Korea, where God looked for the internal Adam and Eve. He first established Adam, and then through Christianity He tried to find the internal Eve. In particular, God established the New Jesus Church. Until then, all Christian cultural realms had known about the Second Coming, but they all believed that the Lord would come on the clouds. At the time, however, God was working in Korea to prepare for the Lord, who was destined to come to earth in a physical body. Meanwhile, internally, the work of finding the Eve was unfolding as a part of Heaven's truly remarkable providence of restoration through Seong-do Kim and his people and through Ho-bin Heo's Inside-the-Belly Church. I was born at 4:30 am on the sixth day of the first lunar calendar month in 1943. My father and mother were brought together under Rev. Ho-Bin Lee, who was newly appointed to lead the church. At the time, my parents were deemed a good man and a good woman and it was said that a great blessing from God would be given through them. During that time, my maternal grandmother, Grandmother Cho, and my mother, Mrs. Hong, concerned themselves only with preparing themselves to receive the coming Lord. Whenever an opportunity to prepare seemed to present itself to them, they went out of their way to find it, and they offered devotions and did their very best. This is perhaps why a new and lively revival movement emerged in Pyongyang at the time. My grandmother and mother thought, believed, that God's will and the providence would all be fulfilled centering on Pyongyang. I had an uncle on my mother's side that had studied pharmacology at Waseda University. After Korea's liberation, he did not return to Pyongyang but instead went to South Korea where he joined the army. My grandmother had only one son, and when she heard this news about him, she wanted to find out why he had settled in South Korea. Thus, Grandmother Cho, my mother and I went to South Korea. My grandfather remained in North Korea. He also firmly believed that Eden would be established in Pyongyang and he said he would remain there. So we left him there and went to South Korea. Around that time, I was six years old, and I remember one incident. Ho-bin Heo had been sent to prison around that time. You may have heard about her in Father's speeches; she refused to see Father in prison and told him to leave. 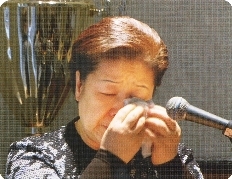 At the time, Ho-bin Heo was in prison, and her mother offered Jeong Seong and received revelations instead of her. One day, she called me and took me to a special place. I vaguely remember that it was on the second floor and not the first floor. She took me there alone, and with her hand on my head, she pronounced a benediction. I can't remember clearly what the benediction was about; all I remember is that she said I was a special child and a child loved by God. Soon after, I went to South Korea with my mother, and two years later, the Korean War broke out. I can't express in words everything I have passed through until now but I can feel that I was raised, nurtured and guided by a great power that is not a part of me. In 1943, Korea was immersed in darkness. I recall now that my mother remembered seeing a vision in a dream, then, of all kinds of metal ware coming across the sea, across the Korea Strait, through the courtyard of the house, and into the room where I was born. Isn't that strange? All those things poured endlessly into the room where I was lying. All kinds of metal ware had been gathered up and taken from Korea when Japan was supporting the war -- sometimes even brass sacrificial vessels were also taken. I think God was giving her a revelation, that although I didn't know it, I was destined to meet Father, and that, with us standing in the position of True Parents, everything would flow into Korea through Japan, which has the mission of the Eve nation. There are many anecdotes, but the story I remember most is about material blessing and that Satan came and said, "Your birth has brought about my downfall. Therefore, I must kill you." He strangled me, but my mother, who had just given birth, used all her strength to stop him and saved me. At the time of the Korean War, many Koreans suffered a lot, but thanks to my uncle, I had relatively less trouble fleeing from the war. We stayed for quite a while in Daegu, and at the time, my grandmother and mother opened a small store. I was less than ten years old at the time, and I had been playing in front of the store when a passing ascetic or perhaps a Buddhist priest asked my mother if I were her daughter. She answered yes, and he told her not to exchange me for ten sons and to raise me well because I was precious. He also told her that I was destined to marry at the age of seventeen, even though I was then less than ten years old and it was a time of war and everyone was suffering. He added that my husband would be much older than I. I don't know if he said this because it was wartime, but in any case he also said that my husband would be a man of considerable means who would dominate the land, sea and air. Many more examples tell of how I was protected and how people testified about me wherever I went. I can't relate them all; what I want to impress upon you is that, without my knowing about it, I was guided by God to be where I am now. I have always done my best, though from God's viewpoint and True Father's, I must have been inadequate in many ways. Recently, I heard that at a gathering of some of the thirty-six blessed couples someone asked what the Unification Church would have been like if Father had not married me. The wives all said that God had truly done well to bring me to him, and that they should express their thanks to me. When I heard this, I felt as if they knew that I had tried hard. At first, I didn't understand anything, and I had forgotten what the passing monk had said, he who had foretold that I would marry at seventeen. However, it actually happened that I indeed married when I was seventeen. When that happened, I observed that the providence of restoration and biblical history are very complicated. So, I resolved to do the best I could, no matter how difficult it might be, to achieve what God desired, the ideal He envisaged at the Creation, and to simplify all complicated matters and arrive at simple solutions. Heaven blessed us with many children, and I did my best in giving birth to them all. From 1960 to 1975, especially in 1973, when Father began his work in America, we had many difficulties. Communists followed Father wherever he went and interfered with his work, and there were many threats and dangers along the way. My nerves were on edge all the time. I had to move constantly in cars, so over a five-year period I had many miscarriages. In 1975, Kwon-jin was born, and after that I gave birth to five more children. The truth is that it was very difficult for me. The doctor told me, "You should stay healthy for the children you have now. Why aren't you concerned about yourself?" From my point of view, however, I couldn't say I wanted to stop. I prayed to God, asking Him how many children He wanted me to have. I also asked a senior lady member, who was spiritually open, to offer special prayers to find out what I was supposed to do. She went up into the mountains for three days to pray especially for me. She returned and told me, "Mother! God says you should have thirteen children." Then I had Young-jin; I tried to give birth by natural delivery, but the baby's head was large and it seemed I might die during childbirth. Father was in Germany, and the doctor said that both mother and baby would be in danger if a decision was not made in thirty minutes. I had no choice but to have a caesarean section, and so Young-jin was born. Once you have a caesarean section, you can't give birth by natural delivery again, because the part that is cut open loses elasticity. Therefore, I had to offer a special prayer to find out what God wanted me to do. Heaven confirmed that God was waiting for me to give Him thirteen children. After that, I had Hyung-jin, who was the youngest son, and two daughters after him. What's interesting to note is that in the 1960s Yoon Cheong Jeong Shim was very supportive of us, and she also came to church diligently and offered prayers. One day I asked her, "How many children should I have?" She didn't give me an answer about that, but she said that my last two children would be girls. To be frank, I thought that if I was going to bear more children that I would prefer to have sons rather than daughters, but she said my last two would be girls. When that came about, I remembered her words. Hyung-jin is my seventh son, and including the last two daughters, I also have seven daughters. So I have given birth to fourteen children, an equal number of boys and girls. [Father:] Mother, you have spoken well. Thank you.